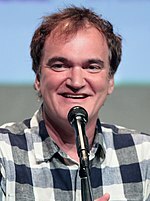 Quintinus Tarantino (natus Knoxopoli Tennesiae die 27 Martii 1963) est moderator cinematographicus, histrio, pellicularumque scriptor et factor Americanus. Bernard, Jami. 1995. Quentin Tarantino: the man and his movies. Londinii: HarperCollins. ISBN 0-00-255644-8. Greene, Richard, et K. Silem Mohammad, eds. 2007. Quentin Tarantino and Philosophy. Sicagi: Open Court Books. ISBN 0-8126-9634-4. Vicimedia Communia plura habent quae ad Quintinum Tarantino spectant. Novissima mutatio die 30 Maii 2017 hora 10:12 facta.